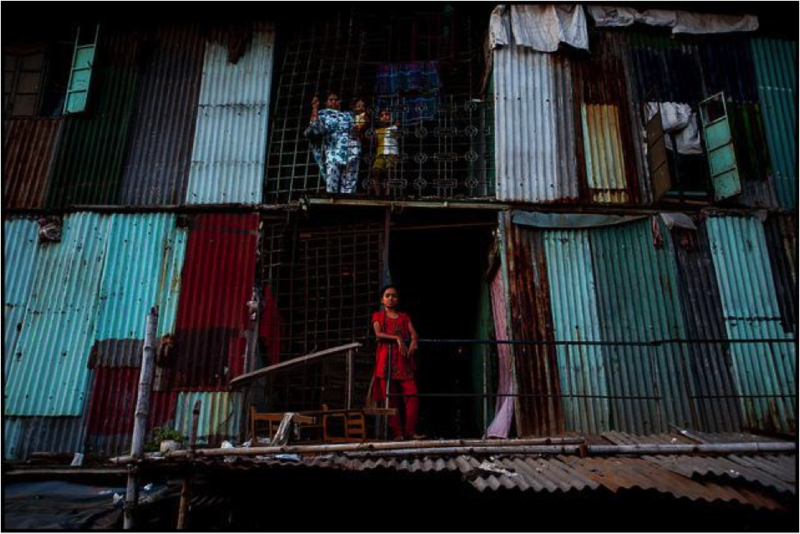 Above: Slum apartment complex in Dhaka, Bangladesh. Photography by Zoriah. The homes and temporary housing of residents in informal settlements, slums, and refugee camps, often do not provide adequate shelter for inhabitants. We think of buildings and houses as safe spaces – spaces that shield us from the dangers of the outside. It locks out unwanted visitors. It safeguards you from elements. Housing provides you with a place to call “home”. On top of this, it is the frontlines of prevention and protection in terms of health. This is particularly true for the poor who are more vulnerable to external shocks. ouses of the poorest are often built urgently, informally, and spontaneously to address the fundamental needs of shelter. With limited financial resources, buying decent and adapted materials is difficult, if not impossible. Hiring the right technical labor to put together a well-built house is also a very ambitious, and low priority for the poorest. Ultimately, no one is held accountable to help them access adequate, liveable, and healthy housing. This is especially true in less economically developed countries where governments tend to prioritize other urgencies. There is less incentive for companies to invest resources, time, labor, and effort because profits are marginal. That being said, what is a standard? How are codes set? By who and for whom? Who should enforce these requirements for the poorest if they do exist and who holds builders accountable? Is it realistic, relevant, and/or necessary to have building minimums for housing in vulnerable communities that may be temporary? Some may argue that the issue is simply about urbanization, urban planning, economic development and poverty, or homelessness. Others may think that the problem is about implementing requirements in an equal manner. In the US, every building falls under a certain category and needs to meet a certain set of requirements that ensure safety. Some of these codes are broad and apply to all structures while others are determined by specificity. For example, in New York City, affordable housing addresses the need of those who struggle to find adequate housing. This affordable housing adheres to minimum building codes set by the city and state. Not only do these housing units need to meet basic requirements allowing for egress and fire protection, they must also follow guidelines for active design, energy efficiency, and resource conservation. There has been a recent trend where designers believe that buildings should be held to higher standards in terms of their environmental impact as well as human comfort. The most well-known example of this is the Leadership in Energy and Environmental Design (LEED) Building Standards that regulate the design of environmentally responsible “green” buildings. Another design standard that rethinks health and well-being in built environments is WELL. Could we think of a world where those living in the worst housing could at least aspire to have a minimum protection that would act as a solid fortress against debilitating diseases that trap them into a cycle of poverty? In the most vulnerable communities of the globe, the buildings fulfilling housing needs rarely adhere to any standards at all. Having similar standards for the housing in vulnerable communities can be hugely beneficial on the individual, community, national, and global level. 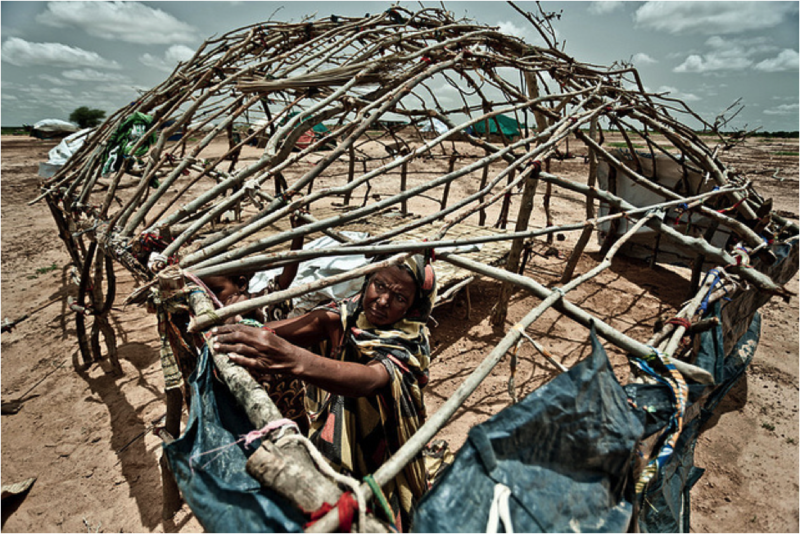 Even the most basic housing can help prevent deadly diseases and illnesses if designed to do so. Adequate shelter can boost an individual’s health and their ability to contribute and take part in society. Mentao Nord Camp in Burkina Faso. Photography by Oxfam International. Could setting basic building standards for the housing of the poorest be a comprehensive strategic development and poverty alleviation strategy? In some ways, shouldn’t we be expected to uphold certain requirements for everyone because of our fundamental beliefs in access to healthy, adequate shelter as mentioned by the UN Charter of human rights?